Nothing beats the elegance of Indian traditional wear. These days, Asian women are dressing it up by choosing outfits that are Western in style, but with added elements of Asian-traditional, thus channeling their Asian heritage into what they wear. Asian designers are currently enjoying the limelight in the UK’s fashion scene. These bold designers of today are being celebrated for their designer Asian clothes in the UK that portray innovation, festivity, feistiness, and vigour that showcases their vibrant heritage. 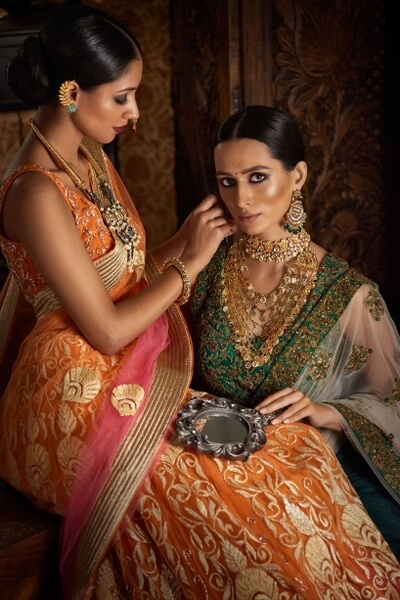 Traditional Asian outfits have seen some remarkable makeovers in recent fashion shows, with the saree and lehenga dominating the catwalk in their current avatars. The creative genius of these designers is seen in the Indian western dresses in the UK, which are an amalgamation of traditional elements like lehengas, with western cuts and silhouettes. With increasing availability of creations by Indian fashion designers in London, there’s an added pressure on customers to dress in designer clothing for all important functions. However, everyone does not have the financial means to repeatedly invest in designer outfits. Here are some tips to rock a designer look without blowing up your bank account. Build an Eclectic Collection Firstly, you don’t need to purchase expensive outfits by Indian fashion designers in London for every occasion. Buy a few timeless pieces that you can repeat for several seasons. Have a mix of high and low end labels in your collection that you can choose from depending on the importance of the occasion. Use your creativity to style yourself differently for every occasion. Change your appearance with accessories so you look fresh and different every time. Think About Styles You Want Make a note of the type of designer outfits that are most important to you – that complement your lifestyle and personal style. Take the list with you when you go shopping – this will prevent you from getting distracted and splurging on something that you may regret later on. Look for the type of outfits that are on top of your list. Once you’ve picked up your essentials and you’ve got money left, look at other creations that catch your eye. Find Your Designer Match From designers of Indo Western dresses in the UK to designers of high-end bridal outfits, you’ll find all types of labels when you shop at a multi-retail apparel store. Find a designer whose creations resonate with your lifestyle, personality and sense of aesthetics. Research different brands so you have a fair idea of which ones you would want to look at while shopping. Take a look at designer info on the store’s website. Alternately, book a style appointment so a personal stylist can help you find exactly what you’re looking for. Have Fun with Fusion Wear Invest in Indo-Western dresses in the UK – they’re popular, fashionable and very comfortable. Whether they’re available as ensembles or separates, designer fusion outfits leave lots of scope for experimenting with your looks. If it’s a gown or dress, you can change accessories to create different looks. Even better if they’re separates like tops, kurtas, palazzos or dhoti-pants because you can mix and match to create innumerable interesting looks. Follow these tips for smart purchasing of Indian designer outfits. Wear your outfit with a million dollar smile and loads of confidence to charm everyone around you!